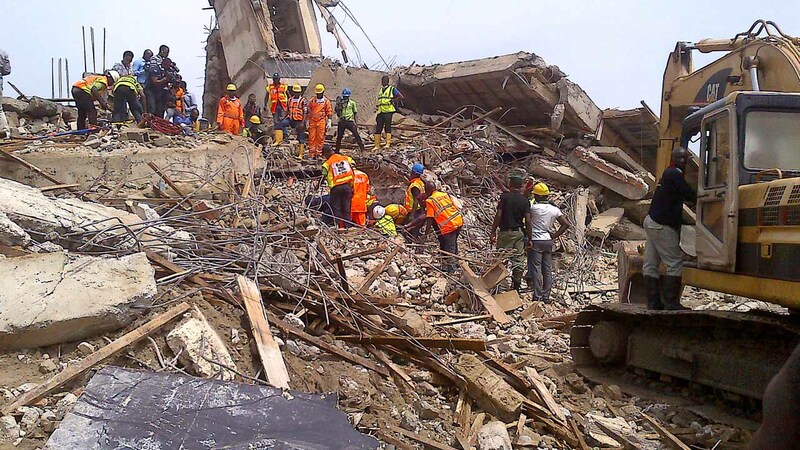 The Lagos State High Court, Ikeja, heard on Wednesday that the five-storey building that collapsed in Lekki Gardens on March 2016 was approved as a three-storey building. At least 35 people were killed in the incident. A prosecution witness, Maruis Agwu, disclosed this during cross-examination by Chief Wole Olanipekun (SAN), counsel to the first, sixth and seventh defendants. The Managing Director of Lekki Gardens Estate Limited, Richard Nyong, is the first defendant in the case. He is standing trial alongside Lekki Gardens Estate Limited; Get Rich Investment Limited, also known as Horizon 1 Extension; House H15; Mr. Sola Olumofe; the firm’s contractor, Odofin Henry Taiwo; Omolabake Motunde, Omotilewa Oluwatosin Joseph and HC Insight Solution Limited. They were arraigned on a six-count charge of failure to obtain building approval for the collapsed building and involuntary manslaughter. They all pleaded not guilty to the charges. Agwu denied giving out the construction work to one Lanre Kuyebi who he said is not an engineer. The witness told the court that he is an architect adding that he designed the building and had nothing to do with the construction of the structure. “I don’t handle structures but only designs. I only handled activities, which was limited to the design of the structure,” Agwu stated.